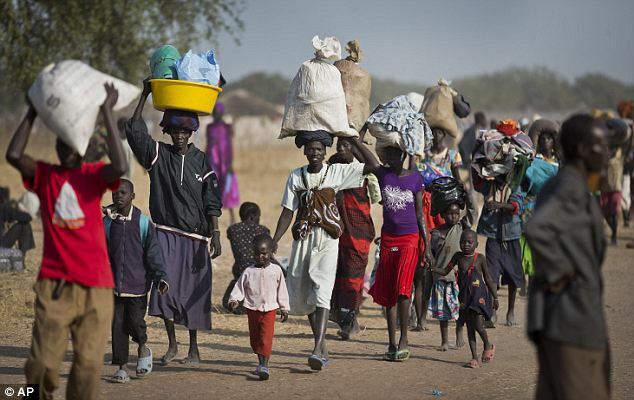 In December 2013 South Sudan, a country yet to celebrate 3 years of independence following separation from Sudan, was once more afflicted by violent conflict. 10 months later, with the death toll in the thousands and a nationwide humanitarian crisis affecting millions more (including over 100,00 displaced people in UN camps), the SPLM (Sudanese Peoples Liberation Movement) government headed by President Salva Kiir and the breakaway SPLA I-O (Sudanese Peoples Liberation Army In Opposition) led by former vice president Riek Machar, seem no closer to reaching a substantive peace agreement. A number of documents have been negotiated, drafted and signed in by representatives of the respective parties in the Ethiopian capital of Addis Ababa, where peace talks facilitated by the East African regional body IGAD (Intergovernmental Authority on Development) have been talking place intermittently since January. Each successive agreement has in turn been violated, often within hours of the triumphant press conference announcing the momentous signatures, and both factions stand accused of serious human rights violations including the targeting of civilians and the widespread employment of sexual violence. IGAD, itself comprised of countries who all have vested interests in events in South Sudan, has also come under fire. In 1982, the Sudanese Peoples Liberation Army (which preceded the formation of the SPLM), was forged through a Sudanese army mutiny that began the Second Sudanese Civil War. The original SPLA was led by JohnÂ Garang and Kiir worked with him as another leading commander.Â Garang died in a helicopter crash in 2004, weeks after the signing of the Comprehensive Peace Agreement (CPA) with Sudan that set a timeline for self determination. Kiir, whilst not a charismatic visionary like Garang, has been renowned as a wily diplomat adept at negotiating the toxic internal politics of the movement and keeping dissenters on the inside using his â€˜Big Tentâ€™ strategy. However he seemed to take a more authoritarian turn after the punishing economic stand-off with Sudan that took both countries to the brink of economic ruin in 2012. With the oil revenues that account for over 90% of South Sudanese government revenues shut off the entire country suffered; the accompanying â€˜austerityâ€™ measures undoing many nascent post independence gains in reversing poverty. In July 2013, as criticism mounted, Kiir, who is aÂ Dinka, sacked the whole cabinet, including the firstÂ Vice President, Machar who is aÂ Nuer. Riek Machar stands accused of repeating past crimes; his leading role in the drafting of the â€˜Nasir Declarationâ€™ in 1991 and leadership role in the subsequent revolt against SPLA/M founder John Garang led to a sustained period of bloody in fighting within the movement. Not only did this include targeting of Dinka civilians, most shockingly in the Bor Massacre of 1991, but also accepting funding, arms and later ministerial posts from the Bashir regime in Khartoum. 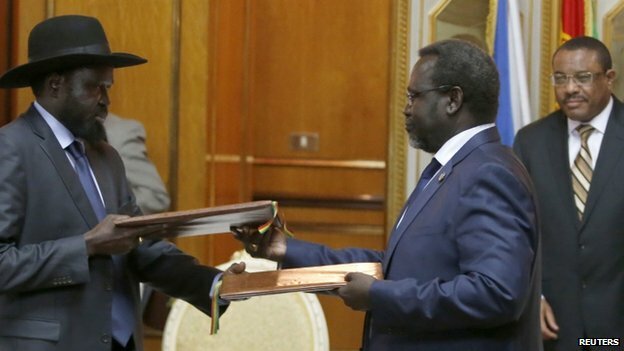 Having eventually made peace with Garang after the latter signed the 2004 Comprehensive Peace Agreement with Khartoum, Machar received plaudits for his outward facing, business friendly endeavours as Vice President. However to some he has always remained a traitor waiting for another chance to seize the reins of power. The following scheduled SPLM Convention, only the 3rd in history of the party, was to signal a showdown between Kiir and a number of critics and potential challengers for his position of chairman, including not only Machar but Party Secretary Pagan Anumn, current Vice President James Wani-Igga and Rebecca Garang, respected elder stateswoman and widow of John. When the already delayed Convention was abruptly cancelled, some of these figures announced their own rally in Juba. On the evening of December 15th the shooting started; allegedly after Dinka soldiers attempted to disarm their Nuer counterparts. Running battles were fought across the city and within days the violence had spread to a number of other states with the opposition making quick gains. One can freely hear amongst certain sectors of South Sudanese society the observation that without the intervention of Ugandan president Yoweri Museveni, a close ally of Kiir, and his deployment of Ugandan troops and military hardware to shore up the ailing SPLA, the government would have fallen early in 2014. Uganda, as an IGAD member, could be seen as having a fundamental conflict of interest in relation to the peace process of which it is a steward. 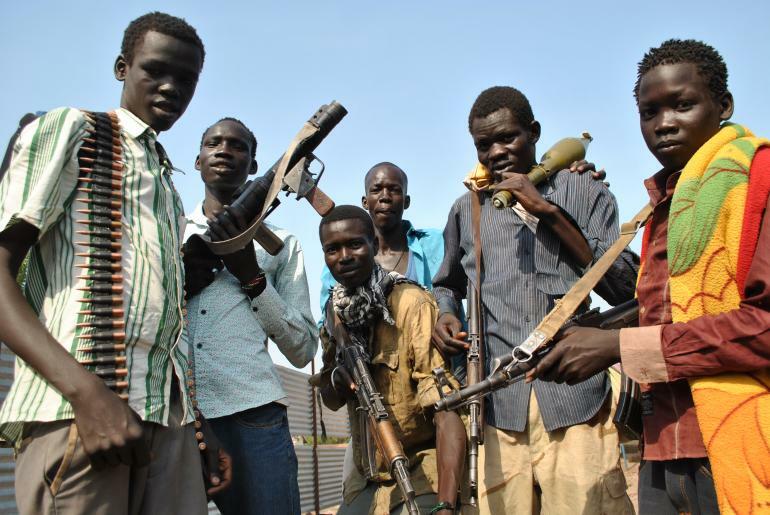 JEM (Justice and Equality Movement) rebels from Darfur have also fought alongside government troops, whilst the Kiir government has suggested that Sudan has revived links with Machar to provide funding and weaponry to the opposition. At present large swathes of Jonglei, Upper Nile and Unity States, not coincidentally all resource rich, are held by opposition troops, with some attempts to create parallel governmental structures under way. Power and control over key oil and mineral sites is one key factor in this conflict, which cannot be reduced to an essentialist ethnic confrontation. The government and their supporters are not a monolithic Dinka bloc and include a range of perspectives and position; neither is the opposition exclusively Nuer. This is a personal power struggle playing out on a national scale, in the process tapping into a range of deep seated grievances. There is certainly direct ethnic violence and discrimination being practiced in South Sudan today, and more so in the current civil war. The key question is; is this the driving factor pushing the country deeper into conflict? Rather than rabid masses baying for the blood of rival peoples, it is a few ‘Big’ men in entrenched positions of power, often with directorships on the boards of companies which set to profit from secure access to and exploitation of previous natural resources, who are putting their own sense of entitlement ahead of the very self determination and independence they claim to have fought for. They foment and exploit ethnic tensions in the process is further evidence of the deplorable means that they will employ to achieve their ends. The parties to this conflict, in the tradition of the SPLM over time, rely on the power blocs that back up various key figures. These constituencies are sometimes drawn from military units, sometimes from political affiliates and sometimes from loyal ethnic militias.For example; Machar can count amongst his supporters the White Army, a Nuer militia named for the tradition of its young warriors to mark themselves with ash prior to battle. Some of the worst accusations of human rights violations have been levelled against this loosely constituted group. Whilst the tendency of the opposition to distance themselves from these actions and the leadership of the White Army is at least in part a cynical move to avoid accountability it also reflects a genuine dynamic in this conflict that stems from the reliance of both formal bodies on irregular and unpredictable militias. It is not just defecting professional soldiers swelling the ranks of these groups. The frustrations of youth across the country disenfranchised by state and corporate land grabs and the lack of support for the agricultural sector that provides livelihoods for the majority of South Sudanese, provide fertile ground for recruitment. Whatever agreements are made at the most senior level, the decentralized command structures of the forces involved on the ground, the complex web of pre-existing political agendas and inter-communal vendettas and the attendant opportunities for a number of different actors to grab land, resources and power, make for an incendiary combination. Armed violence, employed during â€˜the struggleâ€™ as a means to achieve liberation, now serves goals of enrichment, exploitation and revenge, as a norm that perpetuates and reinforces itself within state and non state structures alike. Without a cohesive unifying ideology, or even a concerted attempt to develop one within the dominant movement, to help steer political discourse post independence, this pattern of destruction could take a fatal hold on the country as a whole. What can challenge and change this patriarchal and corrosive approach to leadership is difficult to determine and ultimately such decisions should and will be the preserve of South Sudanese themselves. The heavy presence of the international community, the project of building the South Sudanese state, the dynamics of aid dependency and the opening up of the oil fields during the post CPA period in South Sudan has done little to allow space for the growth of mechanisms to promote this bottom up indigenous decision making. However, traditional conflict resolution structures, whilst undermined by generations of death, displacement and state intervention and manipulation, still remain a potentially powerful force in establishing safer spaces for civilians of all ethnic backgrounds and laying the foundations for an inclusive citizenship. Finally the involvement of the most marginalized groups in South Sudanese society, especially women, who also bear the brunt of the toll of the conflict, not only in the peace process but in the democratization of the country as whole, would be integral to a meaningful resolution and the development of a more equitable future for South Sudanese. The potential and the hunger for such change exists, but when and how it will find voice and form in such a lethally charged environment remains to be seen.